RVers looking for adventurous summers in the nation’s oldest and most sought-after National Park, are well served to spend their time working for Delaware North at one of several General Stores & Hotels inside Yellowstone National Park! Imagine what a few months spent exploring natural wonders like Old Faithful Geyser, would be like! This could be the Workamping adventure you’ve always dreamed of, and it’s more attainable than you might think! As a Workamper in Yellowstone, you will have the ultimate ‘local’ experience of living inside the park and the spectacular ability to go beyond what millions of tourists are able to see in short visits and really dig in! The National Park Service authorizes partners, such as Delaware North, to operate stores and hotels inside the park systems throughout the US. Delaware North operates about 300 stores in a variety of locations including Yellowstone, where 12 of its general stores are located along with three hotels in West Yellowstone. As an employer, Delaware North does a great job to offer positions to a variety of people from all over the globe. From retirees to younger travelers, college students and everyone in-between, they hire a diverse group of people to help bring great experiences to visitors from all around the world! Yellowstone is the place to be for the summer, regardless of your age! This is the cream of the crop when it comes to Workamping experiences because it offers so many activities for Workampers to enjoy throughout their time there. So, as you can imagine there are many reasons why you would want to apply for a position to work at Yellowstone with Delaware North. Let’s look at some of them. 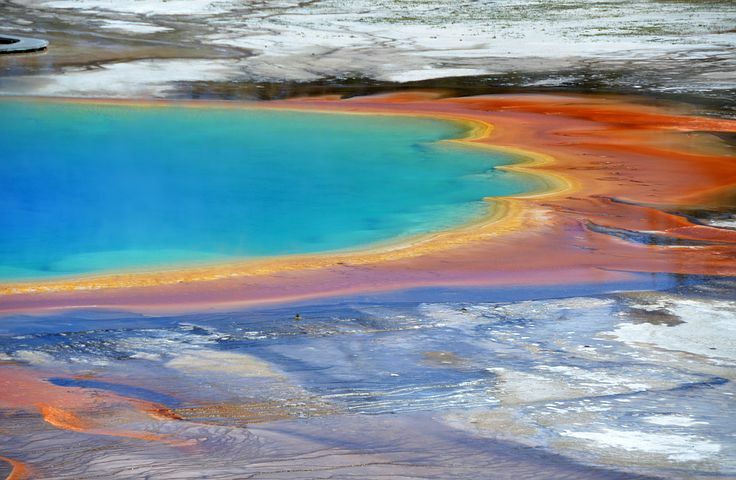 Home to more than 10,000 geysers, hot springs and fumaroles to explore at your leisure! 30% Employee discounts, with select 50% off days throughout the season! The Yellowstone Workamping season usually starts early to mid-April and ends roughly at the end of November. Similar to Amazon Camperforce, you have the ability to provide a start date, and they will do their best to place you at one of their locations. Expect to work 32-40 hours per week, per person. They hire singles, couples, and families, but make sure to discuss your scheduling needs up front. Sometimes split shifts are required which might not work for families needing opposite shifts to account for childcare. The team at Delaware North is very welcoming and do a great job of trying to accommodate everyone’s needs. They also have a very straightforward approach to RV requirements… it just has to have all hard sides to be considered acceptable. Tents are not allowed. I’ll cut straight to the chase, working at Yellowstone will not make you rich! The wages are on the lower side of the average and start at about $9.50 (sometimes more) an hour, paid weekly. 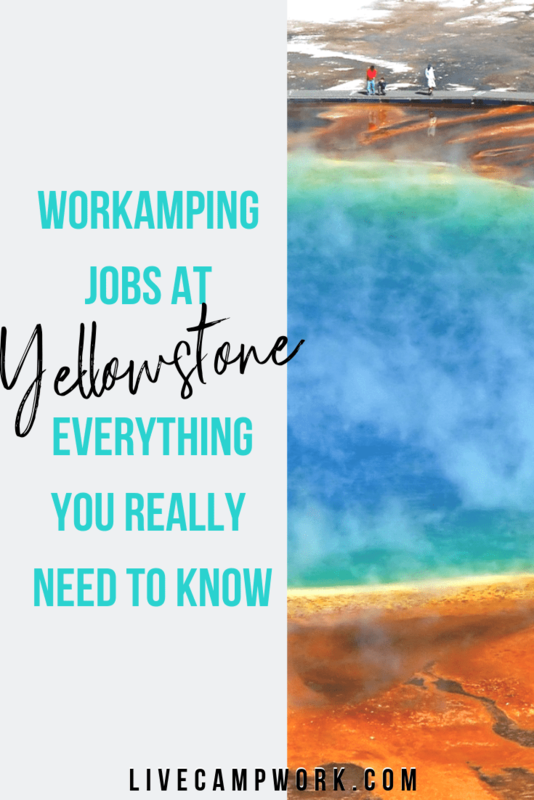 But before you count it out, because you need to take into consideration where you are able to live for a few months… for that reason, I approach working at Yellowstone as a job you take to explore the location, not one that pays for further travel adventures down the road. Also, as a huge bonus, like literally, you will receive a $3 per hour bonus for all hours worked on your final paycheck when you complete the time agreement you signed up for! That’s a great bonus, when most employers offer $.50-$1.00 per hour bonuses! To my understanding, Yellowstone is considered to be very remote. Big box retailers, hospitals and general shopping are not close by and would require a trip to town to pick up necessary supplies and medications or to be seen by a physician. A dining meal plan is available for about $64.00 per week, but only for the associates working inside Yellowstone. The meals are available 7 days a week and are payroll deductible, but you are only able to enroll and/or cancel this rotating menu one time during the season. Workers with strict dietary needs, as well as those working at the West Yellowstone location, may have to make other plans for meals. The meal plan is optional, except for those staying in the dorms. Medcor isn’t actual insurance or healthcare for that matter and should not be relied upon as such. It is more of a way to cover some of the costs of basic medical services offered at the three in-park clinics, which are then offered at a discount to employees. In some parts of the park the internet and cell phone connectivity are limited, and in others, it’s totally unavailable. Be prepared for this experience and think carefully on how being limited in your connectivity will affect you. Wi-Fi is available, though very limited, and some dorms have computers with internet available. Most of the locations have a seasonal post office for you to receive packages and mail. You can have your mail forwarded to these locations, but keep in mind, you will be unable to forward it back- so its suggested you stop the forwarding 2-3 weeks before your end date. Most, if not all positions, are physically demanding and can be quite strenuous at altitudes between 6,000-8,000 feet.